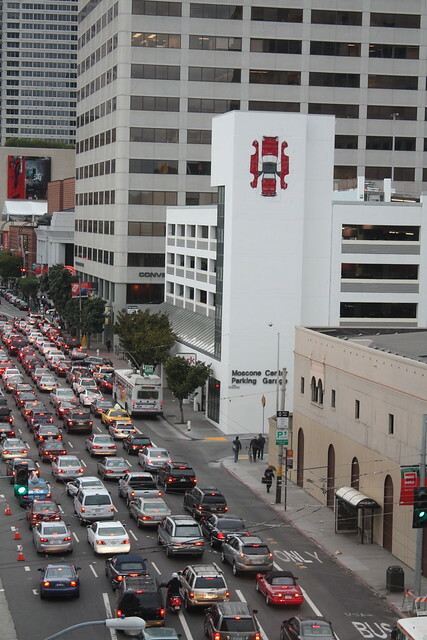 San Francisco’s South of Market district will be crippled by gridlock within a generation unless the city makes major improvements to its transit, bicycle, and pedestrian infrastructure and implements policies that entice commuters to travel by means other than driving. That’s according to planners from the SF County Transportation Authority who aim to avert such a scenario by implementing a long-range transportation blueprint over the next 25 years [PDF]. But the blueprint misses some major opportunities to pursue transit-oriented growth, say advocates. In effect, they argue, planners are making it much harder to avoid a traffic-choked future than it has to be. The projected traffic tsunami comes from an anticipated 101,000 new households and 191,000 new workers between now and 2040, mainly in downtown and along the city’s eastern waterfront, according to the SFCTA. 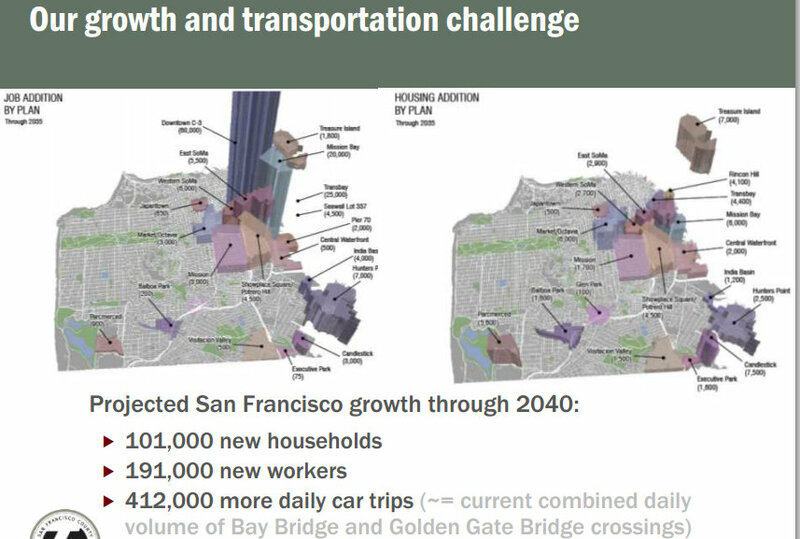 Under the status quo, that growth is expected to generate approximately 412,000 daily car trips, which is about how many are currently made across Bay Bridge and Golden Gate Bridge combined. Chang noted that 80 percent of downtown driving commuters are San Franciscans, while 50 percent of downtown transit commuters come from within the city. “We have a lot of work to do,” she said. The forecast even accounts for major transit projects currently underway, like Bus Rapid Transit routes on Van Ness Avenue and Geary Boulevard, the Central Subway, the Muni Transit Effectiveness Project, and the Transbay Center, as well as planned biking and walking improvements, Chang said. The solution, the SFCTA says, lies in not just providing more dedicated transit lanes and protected bike lanes to encourage travelers to use those modes, but also in policies like congestion pricing, area-wide limits on new parking, and encouraging employers and residential building owners to offer incentives to travel without a car. But the funding available to the SFCTA for infrastructure improvements just won’t cut it: Of the expected $64 billion in revenue the agency will collect between now and 2040, the vast majority is committed to maintenance, transit operations and infrastructure projects already in the works. Only $3.14 billion remains uncommitted. To get the public’s input on how to spend that $3.14 billion, the agency released a “Budget Czar” online simulator that lets residents tell planners how they would set priorities for those funds. Chang said the agency has received about 600 responses, and the simulator will be available through rest of the month. SFCTA staff plans to continue the outreach meetings before releasing a “Financially Constrained Plan” early next year, which would propose a list of transportation projects to fund as well as possible new measures to raise revenue. The final Transportation Plan would be adopted some time next year. Livable City Executive Director Tom Radulovich criticized the plan, saying it should take a broader approach to setting goals and better coordinate transportation and land use planning. Although the city is planning much of its office development downtown, he said, many designated areas have “little or no transit or bicycle infrastructure, and there is no money to build it,” making it more difficult for employees to come by means other than driving. “The SFCTA is forecasting much worsened traffic congestion because of poor land use choices,” he said, arguing that commercial development should be focused around rail stations, as in the Metropolitan Transportation Commission’s Plan Bay Area, a regional plan mandated by SB 375, a state law. “I think of it as an ‘infrastructure efficient’ transportation planning — planning land use around existing and planned transportation infrastructure,” Radulovich added. “We need to make progress in each of these areas, and it isn’t clear at all that this countywide plan will do that,” he said. We’re already close to gridlocked. Planning to continue to accommodate cars is a big mistake. Without cars in the dense, public space, there will be no gridlock. Tom Radulovich is the man. Let’s make this guy mayor of the bay area. That’s a nice shot of the disrespect that the 3rd Street “bus only” lane gets. Enforce the current rules, we don’t need to reinvent the wheel. The city also needs better transit. Somebody wake up the BART board busy building a train to nowhere (Livermore). That’s the problem. Tom Radulovich is our tireless urban advocate, but he’s one vote among a cadre of shameless free-candy-for-their-buddies sprawl advocates. @twitter-14678929:disqus He is a newbie and relatively unknown, but D7’s new BART Board Member Zakhary Mallett seems promising as well. The above picture is worth a thousand words. This city is transit first in name only. Is an arena on the artery of The Embarcadero right at the Bay Bridge onramps help speed up this Total Gridlock I wonder? 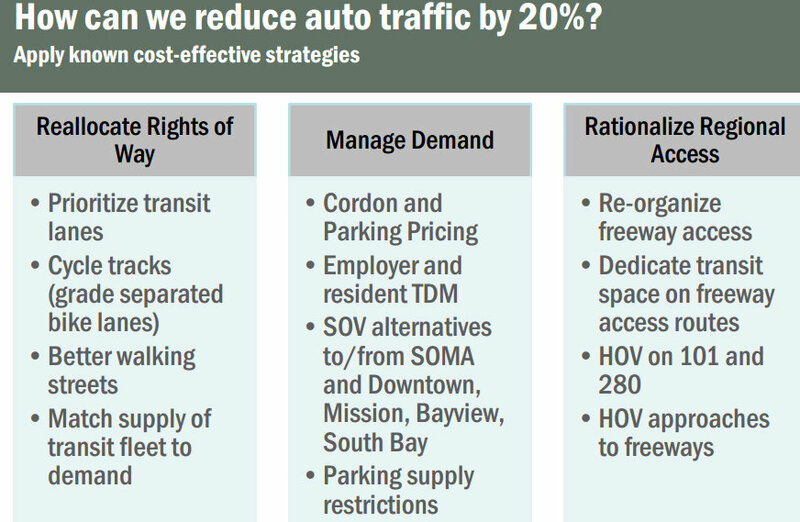 How do we get $120 million to implement congestion pricing as a matter of public health and reducing air pollution near high density residences in East SoMa?